Whoever thought that the Coryule Chorus were just a choir that sang? The noise level at the PIKNIK Cafe on the 7th December was at least as high as that made during our most fortissimo moments in the rehearsal rooms! 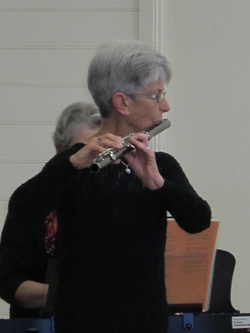 A great way to celebrate our year of music, fun and laughter, depicted in the slide show below. After our huge day of recording, we had to sparkle up 4 days later for our winter concert in aid of the St James hall, our lovely rehearsal rooms. 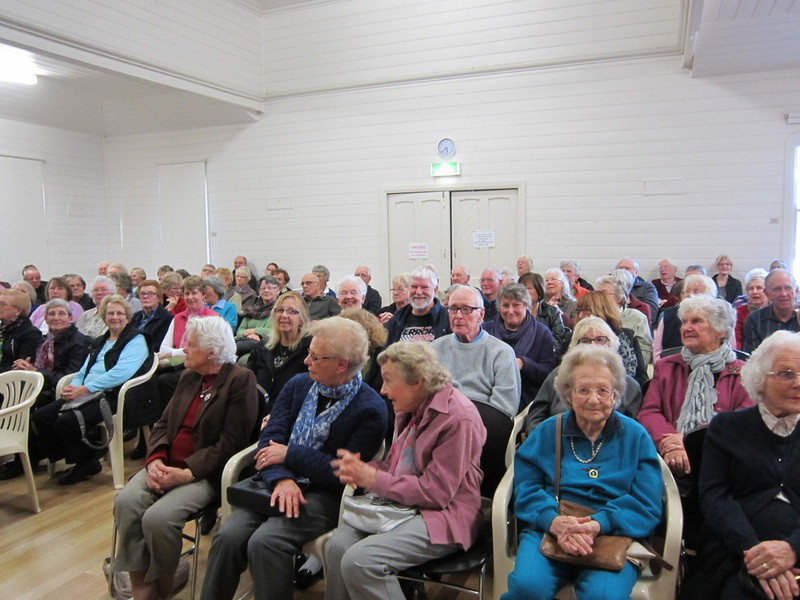 A full house was there to greet us, and we did our best not to let them down. 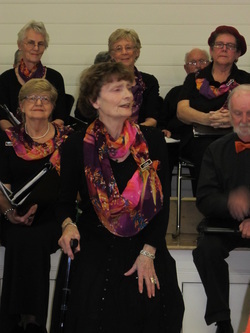 Whilst some of our songs were the ones we had worked so hard on for our CD recording, we also presented a variety of solos, a trio, quartet, band items and other choir songs not on our CD. 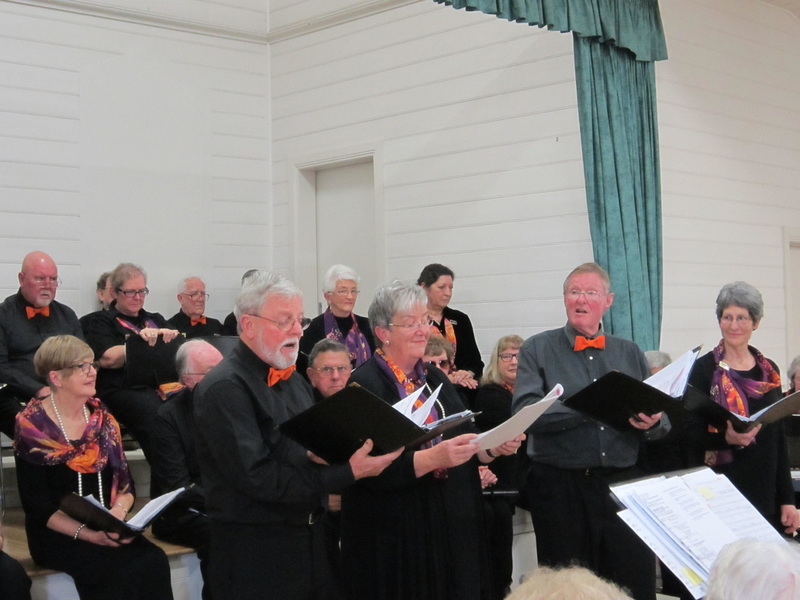 The concert was very well received, and much happiness and relief was expressed whilst we enjoyed the devonshire tea with the audience after our performance. Let's kick it off - with "Ye shall have a song"
And the band played .......... Moon River. What a hit!! The sopranos - with a couple of men to spoil it! It's now the Quartet's turn. Nice one! With a most responsive audience. The brave (but forgetful) Gendarmes! Bernice adds her dulcet tones! Ravel - from another angle. Lena is over the "Blue Moon"
Bob without the gardenias in his hair! Our Quartet not walking alone. The Trio sings us from sunrise to sunset. ..........for now! 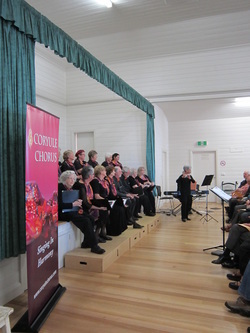 A great occasion for the Coryule Chorus.